The world’s most popular grain is also the deadliest for the human metabolism. Modern wheat isn’t really wheat at all and is a “perfect, chronic poison,” according to Dr. William Davis, a cardiologist, author and leading expert on wheat. Asked if the farming industry could change back to the grain it formerly produced, Davis said it could, but it would not be economically feasible because it yields less per acre. However, Davis said a movement has begun with people turning away from wheat – and dropping substantial weight. To avoid these wheat-oriented products, Davis suggests eating “real food,” such as avocados, olives, olive oil, meats, and vegetables. “(It’s) the stuff that is least likely to have been changed by agribusiness,” he said. “Certainly not grains. When I say grains, of course, over 90 percent of all grains we eat will be wheat, it’s not barley… or flax. It’s going to be wheat. So-called health experts in nutrition who continue to promote the health benefits of wheat are extremely uninformed about the nature of modern wheat and its evolution from growth to consumption. It is shocking how many professionals in public health still recommend wheat products without an assessment of their individual requirements, especially considering the amount of evidence regarding its lack of nutrition and health risks for proportionally large segments of the population. The majority of wheat is processed into 60% extraction, bleached white flour. 60% extraction–the standard for most wheat products means that 40% of the original wheat grain is removed. So not only do we have an unhealthier, modified, and hybridized strain of wheat, we also remove and further degrade its nutritional value by processing it. Unfortunately, the 40% that gets removed includes the bran and the germ of the wheat grain–its most nutrient-rich parts. In the process of making 60% extraction flour, over half of the vitamin B1, B2, B3, E, folic acid, calcium, phosphorus, zinc, copper, iron, and fiber are lost. Any processed foods with wheat are akin to poison for the body since they cause more health risks than benefits. The body does not recognize processed wheat as food. Nutrient absorption from processed wheat products is thus consequential with almost no nutritional value. Some experts claim if you select 100% whole wheat products, the bran and the germ of the wheat will remain in your meals, and the health benefits will be impressive. This is again a falsity promoted by the wheat industry since even 100% whole wheat products are based on modern wheat strains created by irradiation of wheat seeds and embryos with chemicals, gamma rays, and high-dose X-rays to induce mutations. Whether you consume 10% or 100% of wheat is irrelevant since you’re still consuming a health damaging grain that will not benefit, advance or even maintain your health in any way. Dr. Marcia Alvarez who specializes in nutritional programs for obese patients says that when it comes to nutrition, wheat may be considered as an evil grain. “Modern wheat grains could certainly be considered as the root of all evil in the world of nutrition since they cause so many documented health problems across so many populations in the world.” Dr. Alvarez asserted that wheat is now responsible for more intolerances than almost any other food in the world. “In my practice of over two decades, we have documented that for every ten people with digestive problems, obesity, irritable bowel syndrome, diabetes, arthritis and even heart disease, eight out of ten have a problem with wheat. Once we remove wheat from their diets, most of their symptoms disappear within three to six months,” she added. Dr. Alvarez estimates that between the coming influx of genetically modified (GM) strains of wheat and the current tendency of wheat elimination in societies, that a trend is emerging in the next 20 years that will likely see 80% of people cease their consumption of wheat from any form. Some health resources, such as the Mayo Clinic, advocate a more balanced diet that does include wheat. But Davis said on “CTM” they’re just offering a poor alternative. “All that literature says is to replace something bad, white enriched products with something less bad, whole grains, and there’s an apparent health benefit – ‘Let’s eat a whole bunch of less bad things.’ So I take…unfiltered cigarettes and replace with Salem filtered cigarettes, you should smoke the Salems. That’s the logic of nutrition, it’s a deeply flawed logic. What if I take it to the next level, and we say, ‘Let’s eliminate all grains,’ what happens then? A powerful little chemical in wheat known as ‘wheat germ agglutinin’ (WGA) which is largely responsible for many of wheat’s pervasive, and difficult to diagnose, ill effects. Researchers are now discovering that WGA in modern wheat is very different from ancient strains. Not only does WGA throw a monkey wrench into our assumptions about the primary causes of wheat intolerance, but due to the fact that WGA is found in highest concentrations in “whole wheat,” including its supposedly superior sprouted form, it also pulls the rug out from under one of the health food industry’s favorite poster children. Each grain of wheat contains about one microgram of Wheat Germ Agglutinin (WGA). Even in small quantities, WGA can have profoundly adverse effects. It may be pro-inflammatory, immunotoxic, cardiotoxic … and neurotoxic. Below the radar of conventional serological testing for antibodies against the various gluten proteins and genetic testing for disease susceptibility, the WGA “lectin problem” remains almost entirely obscured. Lectins, though found in all grains, seeds, legumes, dairy and our beloved nightshades: the tomato and potato, are rarely discussed in connection with health or illness, even when their presence in our diet may greatly reduce both the quality and length of our lives. Yet health experts dismiss the links between disease and wheat despite all the evidence. Dr William Davis has documented several hundred clinical studies on the adverse effects of wheat. These are studies that document the neurologic impairments unique to wheat, including cerebellar ataxia and dementia; heart disease; visceral fat accumulation and all its attendant health consequences; the process of glycation via amylopectin A of wheat that leads to cataracts, diabetes, and arthritis; among others. There are, in fact, a wealth of studies documenting the adverse, often crippling, effects of wheat consumption in humans. The other claim is that wheat elimination ‘means missing out on a wealth of essential nutrients. Another falsity. Dr. Davis states that if you replace wheat with healthy foods like vegetables, nuts, healthy oils, meats, eggs, cheese, avocados, and olives, then there is no nutrient deficiency that develops with elimination of wheat. Dr Davis also states that people with celiac disease may require long-term supplementation due to extensive gastrointenstinal damage caused by wheat. People with celiac disease do indeed experience deficiencies of multiple vitamins and minerals after they eliminate all wheat and gluten from the diet. But this is not due to a diet lacking valuable nutrients, but from the incomplete healing of the gastrointestinal tract (such as the lining of the duodenum and proximal jejunum). In these people, the destructive effects of wheat are so overpowering that, unfortunately, some people never heal completely. These people do indeed require vitamin and mineral supplementation, as well as probiotics and pancreatic enzyme supplementation. Due to the unique properties of amylopectin A, two slices of whole wheat bread increase blood sugar higher than many candy bars. High blood glucose leads to the process of glycation that, in turn, causes arthritis (cartilage glycation), cataracts (lens protein glycation), diabetes (glycotoxicity of pancreatic beta cells), hepatic de novo lipogenesis that increases triglycerides and, thereby, increases expression of atherogenic (heart disease-causing) small LDL particles, leading to heart attacks. Repetitive high blood sugars that develop from a grain-rich diet are, in my view, very destructive and lead to weight gain (specifically visceral fat), insulin resistance, leptin resistance (leading to obesity), and many of the health struggles that many now experience. Wheat gliadin has been associated with cerebellar ataxia, peripheral neuropathy, gluten encephalopathy (dementia), behavioral outbursts in children with ADHD and autism, and paranoid delusions and auditory hallucinations in people with schizophrenia, severe and incapacitating effects for people suffering from these conditions. According to statistics from the University of Chicago Celiac Disease Center, an average of one out of every 133 otherwise healthy people in the United States suffers from Celiac Disease (CD). However, an estimated 20-30 percent of the world’s population may carry the genetic susceptibility to celiac disease–and the way to avoid turning these genes ‘on’ is by avoiding gluten. When you consider that undiagnosed CD is associated with a nearly four-fold increased risk of premature death, the seriousness of this food sensitivity becomes quite evident. The primary disease mechanism at play is chronic inflammation, and chronic inflammatory and degenerative conditions are endemic to grain-consuming populations. 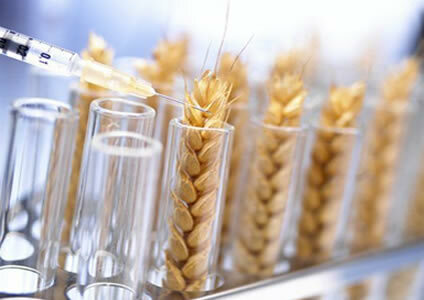 Changes in genetic code and, thereby, antigenic profile, of the high-yield semi-dwarf wheat cultivars now on the market account for the marked increase in celiac potential nationwide. “Hybridization” techniques, including chemical mutagenesis to induce selective mutations, leads to development of unique strains that are not subject to animal or human safety testing–they are just brought to market and sold. * Note that many of the wheat-free options still contain gluten and many people sensitive to wheat may still experience digestive problems and bloating. Experiment in see what works best for you. Caution is advised with cereal grains if you have diagnosed with gluen intolerance. 1. Cereal Grains: Barley, millet, oats, rice, rye, sorghum, tef and wild rice are all in the same cereal grain family as is wheat. All flours ground from cereal grains may be used as a wheat substitute. Commonly available are barley, buckwheat, rice and rye flour. The less utilized flours may be purchased online or from natural food stores. Note: people with a gluten allergy must also avoid barley, oats and rye. 2. Non-Cereal Grains: Amaranth, quinoa and buckwheat are three grain-like seeds unrelated to cereal grains. (Despite its name, buckwheat is not a wheat-relative.) It is rare for anyone to develop a sensitivity to these non-cereal grains. Amaranth, quinoa and buckwheat are gluten-free and therefore not suitable for making leavened bread; however, they make excellent quick breads and cookies. 3. Nut Meal: Ground nuts such as almonds, hazelnuts or walnuts make the richest flour substitute for cookies and cakes. Because their fragile fatty acid content gives them a brief shelf life, it’s preferable to grind your own nuts in a food processor just prior to use. Nut meal requires a binding agent such as eggs. Because chestnuts are lower in fat than other nuts, chestnut flour has a longer shelf life. It is available online. 4. Bean Flour: Dried beans, such as navy, pinto and chickpeas may be milled and used, in combination with other flours, as a wheat alternative. Bean flour is, however, not always recommended. It tastes like beans and makes baked goods dense and hard to digest. 5. Other Flour Substitutes: Potato starch, arrowroot powder, and tapioca are thickening agents that substitute for wheat in sauces and gravy. In baked goods these starchy ingredients serve as a binding agent. Previous Previous post: VIRUSES, BACTERIA CAUSING PSYCHIATRIC ILLNESSES!